To make the dough, in the bowl of a food processor, add the flour, salt and sugar and pulse to combine. Add the butter and process 8 – 10 seconds until the mixture resembles course meal. With the food processor running on the dough setting, add the ice water through the feed tube in a slow, steady stream until the dough comes together and forms a ball. When you’re ready to make the tart, place an oven rack in the middle of the oven and preheat the oven to 425 degrees F.
Remove the dough disc from the Ziploc bag and place on a lightly floured surface. Roll out the dough as quickly as possible working from the center out with each roll. The dough should be about 2″ larger all around than your pan. Lay the dough in the pan and press lightly into the bottom of the pan, lifting the edges and working it gently down into the mold. Trim off the excess dough by rolling the pin over the top of the mold. Prick the dough with the tines of a fork several times. Cover the dough loosely with a piece of foil and then fill with foil weights or baking beads. Bake at 425 degrees for 8 minutes. Remove from the oven, remove the foil and weights, and return to the oven and bake an additional 5 minutes. Remove and place on a wire rack to cool. 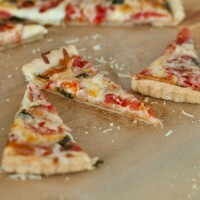 Reduce the oven temperature to 375 degrees F.
Cover the crust with the mozzarella cheese. Add the sliced tomatoes, arranging to cover as evenly as possible. Drizzle lightly with a little olive oil. (I probably only used about 1 tablespoon.) Add a dash of black pepper. (Using my pepper grinder, I gave it about 6 twists.) Add the Parmesan cheese, and then the basil, evenly over the tomatoes. Bake for 18 – 20 minutes or until the crust is golden and the cheese is bubbly. Remove from oven and allow to rest on a wire rack for a about 10 minutes. Remove tart from the tart pan. The easiest way I’ve found to do this is to place the pan over a cup (I used an inverted measuring cup). The outside ring will drop down, leaving the tart on the pan. Slide the tart onto a cutting board. (Cutting on the pan can cause damage to the pan.) Slice and serve. Hostess’ Hint: This is tart best served while warm, about 20 minutes after removing from the oven. Oh, and I LOVE this tart pan ! It’s so easy to use. * Note: Total time for this recipe does not include 2 hours chilling time for the dough.